Environmental Art programs at Bournda have been specifically designed to assist students in learning about their natural environment. 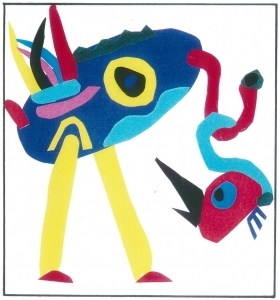 The following art activities have been developed for Early Stage 1 and Stage 1 students. Each of the art activities are designed to heighten observational skills and expand visual expression by using a variety of techniques and materials. Environmental Art can be run as a whole day program, or one or more activities can be run in conjunction with any other Bournda programs. 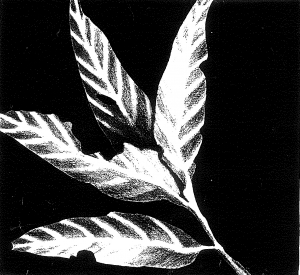 An observational pencil drawing of leaves, paying particular attention to overlapping shapes, irregular contours and pattern of veins. Leaves are used as templates and finished drawings are mounted on black cardboard. 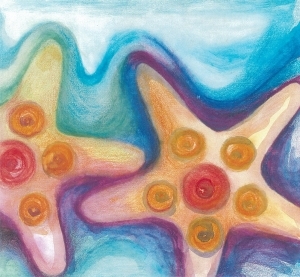 A design based on sea creatures using templates and aquarelle pencils to explore contrasting strong and subtle and warm and cool colour effects. 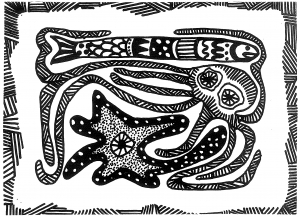 A black and white design using thick and thin felt tip pens, based on Bournda wildlife and inspired by Aboriginal Art. Emphasis on space-filling, abstraction and decoration. A collage exercise designed to extend the imaginative process by using brightly coloured gummed paper to create an imaginary bird. An exercise using fine black pen line and coloured wash to produce a long horizontal frieze of insect drawings. Makes simple pictures and other kinds of artworks about things and experiences. Experiments with a range of media in selected forms. Makes artworks in a particular way about experiences of real and imaginary things. Uses the forms to make artworks according to varying requirements.